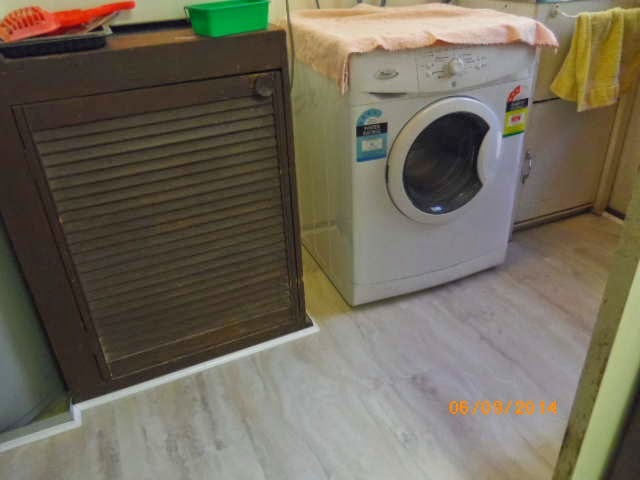 They moved the washing machine with no apparent effort (picked it up and put it outside the back door, Ken looked on in envy), and there was some kind of horrid mess on the floor where the machine had been, so I wiped it up before they could protest. I told them I'd washed the floor last night and they said it was no problem for them to clean up any area that I'd missed. We'd put appliance rollers under the fridge last night, so that was easy for them to move in and out of its spot. 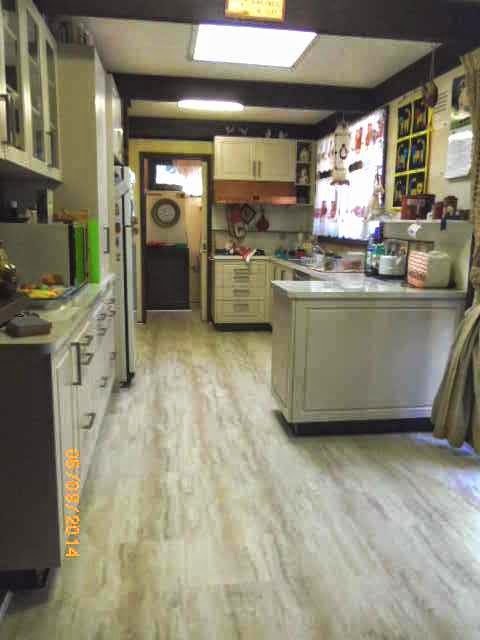 It took them about 4 hours to complete the job - cutting and laying the tiles (Allura Locking vinyl tiles) and put 'beading' (a kind of border) around all the edges except where the kick plate will be under the cupboards. At one stage Tiger peered around the corner to see what was going on, and I picked him up and put him down on the new floor. He did one of those skidding turns and took off - we all laughed! At this early stage we are very happy with the result, and having looked Allura Locking up on the web, they seem to have a fairly good reputation, so we'll see how it goes. 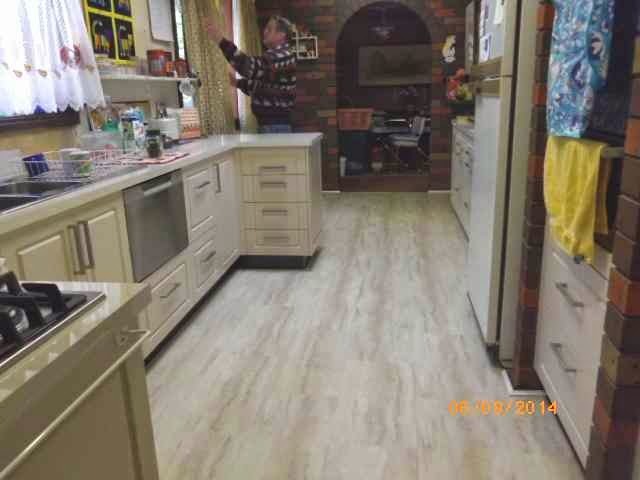 The pattern is called Travertine, and it actually looks better than it shows up in these photos. It feels great to walk on, kind of soft and quiet, and it doesn't need scrubbing or polishing - just vaccum or sweep, then a damp mop. This was taken from the dining room looking toward the laundry. Taken from the laundry looking toward the dining room. We had the floor extended right through to the laundry, as the old floor did that. It even makes the laundry look better!